In beginning to appraise a collection of records from the NYZS Department of Education produced during the 1940s-1980s, NYZS’s important role in producing and presenting motion picture films during the 20th century became apparent. Combing though the surviving records such as film scripts, shot lists, planning and production notes, correspondence, memos, inventory lists and indexes, titles like “From the Pampas to Patagonia,” “The Expedition to Puffin Island,” “Around the Year in the Zoo” and “Herbert and His Friends” emerged to illustrate the range of topics that NYZS invested in to expand their educational role. There are films reporting on research expeditions, studies in animal behaviour, features on facilities the Bronx Zoo and the New York Aquarium, and even films geared towards inspiring and educating the next generation of young zoologists, naturalists, and conservationists. Films were previewed at NYZS’s Annual General Meetings to Society members before often finding additional audiences elsewhere. NYZS audio-visual media services, which at one point was coordinated by the Publications and Photography department, facilitated the use of NYZS motion picture films in venues such as New York City classrooms, professional associations, zoological parks across the country and other venues. “The Locomotion of Snakes,” for example, was produced by staff photographer Sam Dunton in 1952 with then Curator of Reptiles, Dr. James A. Oliver. It presented on the science of animal behaviour and featured the puff adder in what was intended to the be first in a series of educational films on living reptiles, according to the 1952 report from the Department. Page 5 from the film script for “The Locomotion of Snakes,” 1952. WCS Archives Collection 2008. 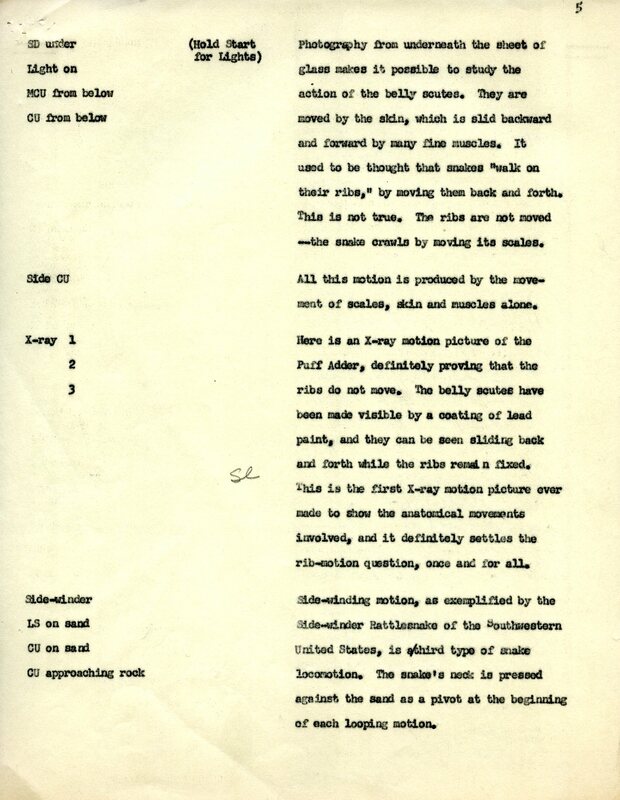 Insights into NYZS’s films like “The Locomotion of Snakes” can be seen through the surviving versions of the film’s scripts, as they document both the production and information content of the films, and also through their associated records, which provide evidence of early collection management activities for these valuable media assets for the Society. Note the footage description and narration (above) and corresponding photograph (below) illustrating the lengths to which staff photographer Sam Dunton was willing to go to document and dispel the myths of the mechanics of motion and movement of the large venomous snake. of Animals: An Unconventional History of the New York Zoological Society, page 477. The New York Zoological Society. 1974. The film was presented at the 57th Annual General Meeting at Hunter College in January 1953, along with other films NYZS produced that year to much fanfare. The Department of Reptiles reported on the success of the film including the audience reception at its premier, additional screenings to professional groups like the American Society for Ichthyologists and Herpetologists and the American Association for the Advancement of Science, as well as the film’s subsequent sale and distribution via McGraw-Hill that would bring the film to future audiences. Work on the second film in the series began that year in earnest. 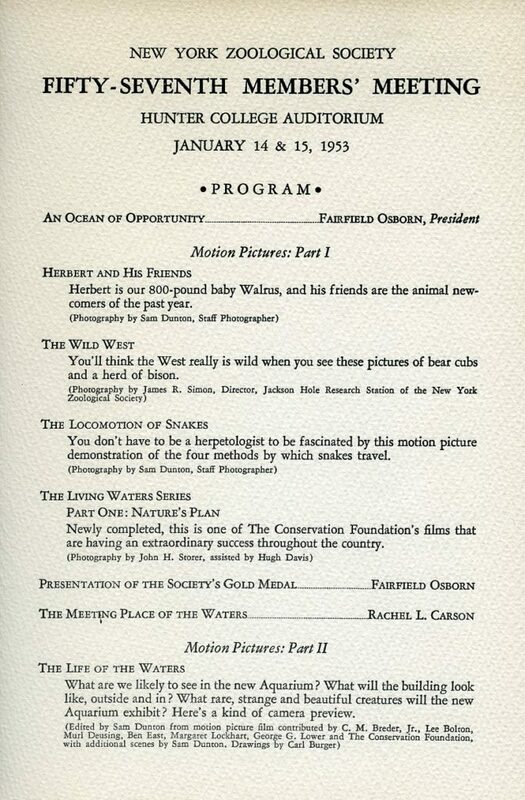 Program from the 57th Annual General Meeting of The New York Zoological Society, 1953. WCS Archives Collection 2016. The processing project runs from June 2016 to June 2017. I look forward to sharing project news and discoveries from the collections over the next year. 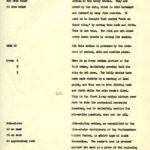 This post was submitted by WCS’s NHPRC Project Archivist, Emma Curtis, who joined the WCS Archives in July 2016.